If there is one genus above another that epitomizes the class, it is this one, illustrated here by specimens of Phacops africanus from the Devonian of Morocco. 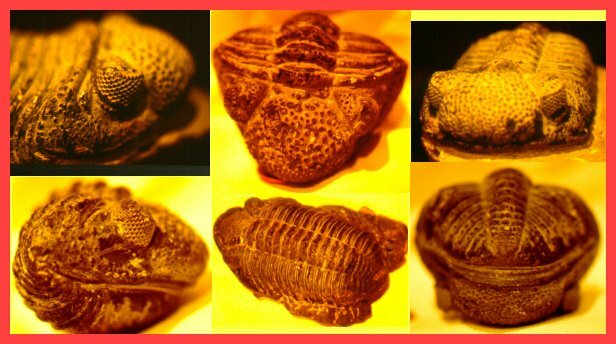 The popularity of these fossils contributes largely to the profitability of the Moroccan trilobite mills. Whereas good specimens may bring in several hundred dollars, the clever Moroccans have figured out how to create perfect replicas of inferior specimens that easily fool casual buyers. In fact, if you have paid less than $100 for a Phacops from Morocco, chances are that it is either a cast cemented to a real Moroccan rock, or a part of an actual specimen largely reconstructed with black epoxy. You can easily determine this by dipping the specimen in water, which reveals the waterproof casting material! Phacops is in Order Phacopida [(Cambrian? )Ordovician - Devonian] and Family Phacopidae with the same range, but the genus is limited to Devonian strata.